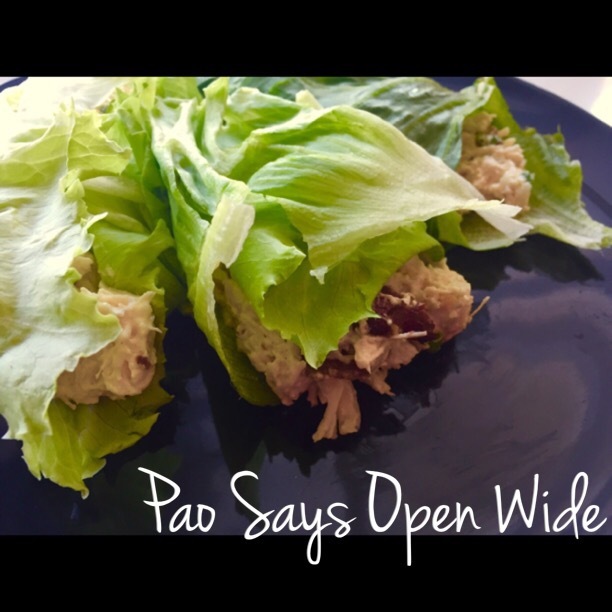 Light and Lovely Lunch: Chicken Salad Lettuce Wraps – Pao Says, "Open Wide!" This morning, I finished up with one of my patients early, giving me time to whip something up for lunch. I was wanting something light, since I had pasta the night before, so I decided whatever I was eating, I’d wrap it in lettuce… That’s healthy, right? I feel like I could wrap chocolate in lettuce and justify its healthy properties. Anyways, I decided to go with a chicken salad recipe that one of my aunts makes. The mix took me about 15 minutes to put together, and you can use it as a sandwich spread, a side item, or a dip! I’ve been know to dip a tostito or two in this deliciousness. Drain and shred the chicken (shreds easily with a fork). Add the remaining ingredients and mix well until combined. That’s it! So easy right?? I scooped it into a few iceberg lettuce leaves and called it a day, but when making this a dip, I typically add about a 1/4 cup more softened cream cheese and heat it up a bit to make it easier to scoop.